I went down to Charlottesville to shoot the August Rivanna IDPA match on Saturday. For August, the weather was surprisingly pleasant not overly oppressive. It was certainly better than we experienced during last weekend's rifle class. The first stage our squad shot was reminiscent of a stage from last month's Cavalier match, though with a couple more targets set over a slightly wider spread. The six near and one far target were engaged in tactical sequence while seated. The gun started with a magazine inserted but with an empty chamber, and all reloads were from the table. The placement of the non-threats meant lots of shifting in the seat to see all the targets. Strong and weak support hand only shooting was required on the third stage we shot, which consisted of two limited round strings. 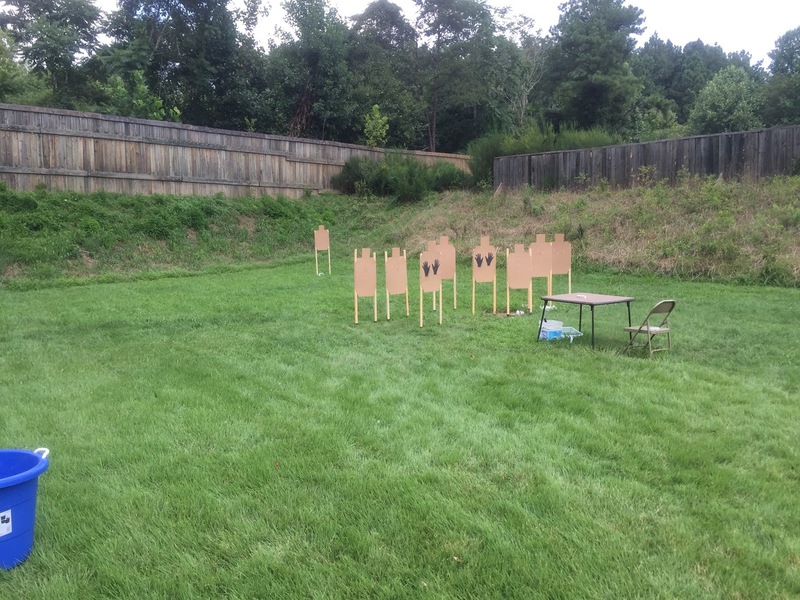 The first string required three shots, freestyle, on a ~20 yard target, a reload with retention, then six SHO shots on a 10 yard target. For the second string, the three shots on the far target and reload were followed by six WHO shots on a seven yard target. I was pleased with my SHO and WHO shots, thankfully that practice is paying off, though I got a little sloppy on the distant target. 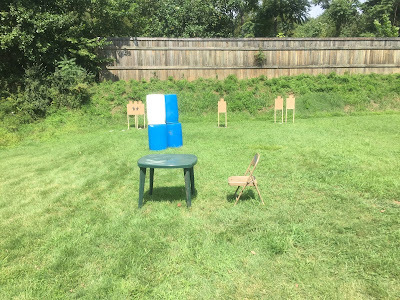 The final stage I shot, which was Stage 1 of the match, offered a switch from the usual table start — we were seated facing to the side of the range, the targets to our right. Upon the signal, we turned in the chair and engaged three targets with three rounds each. Them moving downrange, we engaged two more targets from cover. There was a side BUG match being held a well, and I had originally planned to shoot that at some point during the day. However, the fast moving match meant I never had a enough down time to do it between stages. After the match there was a large group of shooters waiting, so I opted to hit the road for home and lunch. The quick, simple stages kept things moving quite well, and we never never had to wait on the squad ahead of us to finish shooting. Temps in the upper 80's, intermittent cloud cover, and even the occasional breeze kept things relatively pleasant. It was an enjoyable match with a fun crowd of shooters. The stages at Rivanna are often deceptive in their simplicity and the matches always offer variety of challenges. Other than a couple of poor shots, I was pleased with how I shot. As usual, I'm already looking forward to some practice in preparation for the next match.